I have officially broken up with the Scantron machine. We had a decent run, but the recent mess of semester finals helped me to discover there are far more attractive options on the market. The best new scoring machine I’ve found is actually my phone, or more specifically the ZipGrade app on my phone. Over the past two months, I’ve run ZipGrade through its paces, scanning in-class surveys, quick formative assessments, and full end-of-unit exams. The result? I’m a fan and have given away all of my old Scantron forms. 1. Speed. In the time it takes to walk across campus to the faculty lounge and wait in line for the tempermental Scantron machine, I can snap a photo of each answer sheet with the app, transfer all of my students’ data to a PDF, and send the PDF tally sheet to my email account. 2. Accuracy. Unlike the Scantron machine, ZipGrade allows me to quickly review each test paper question-by-question, making sure that the scan was correctly read and that messy students’ smear marks weren’t accidentally miscounted. Oh, and no calibration of a rickety old machine needed. 3. Convenience. The answer key documents are available for free here on the ZipGrade site. The cost of running photocopies of those score sheets is a few pennies cheaper than those green Scantron forms, but the real advantage is that the sheets don’t have to go through our purchasing department and I don’t have to beg a pinch of a stack from the Form Hoarders. Instead, I just go here, print the form I need, and run copies. Done. I also made my own paper-saving options by adding two answer sheets per page, which the app scanned with no trouble. Go here to grab the two 50-question answer sheets per page and the two 100-question answer sheets per page options. 4. Fun. The kids think it’s super-cool that I can zap their answer sheets with my phone and immediately show them their scores. Bubble-dot tests and surveys can be hip? Who knew? 5. Storage. All of my class sets of exams are now stored on my phone for as long as needed. If a student wants to review his sheet, I can send a PDF that includes his scan and the key straight to any email account. Since test security is an issue and I don’t want to re-write tests each year, I send reports only to my own email for in-class viewing on my laptop screen, but you could send copies to students’ or parents’ email accounts, depending on your needs. 6. 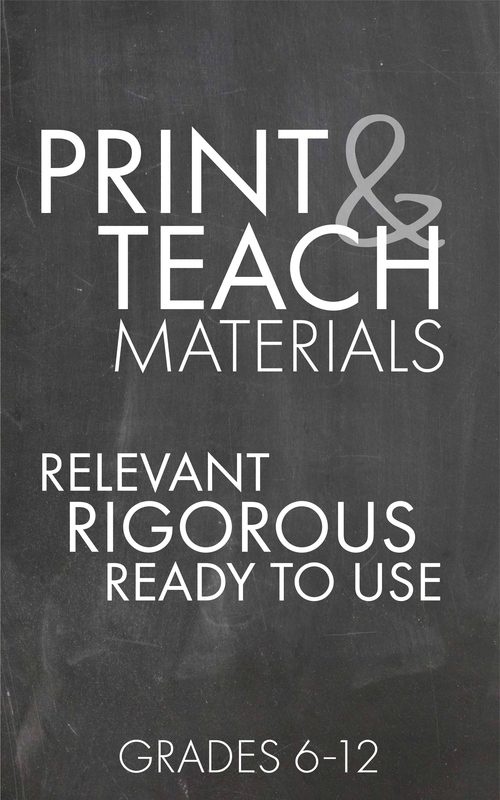 Item Analysis = Better Teaching. Unquestionably, this is the app’s best feature because it lets me see what percentage of students missed specific questions. With the Scantron, gathering this information was tedious and, frankly, never happened. Now, though, I can immediately see troublespots, allowing me to figure out whether I made an error on the key, used wonky wording on a test question, or maybe, just maybe, didn’t do a good job teaching that specific content. Self-reflection? Yup, that’s actually happening now. The app costs $6.99 for 12 months of scoring an unlimited number of papers, but the app download and first 100 scans of answer sheets are included in the free trial if you’d like to try before you buy. I found this after reading the post about your Scantron nightmare. I had one of those moments this past week when three kids had answers marked wrong on their tests. I am certainly using this app on the next test I give to see how I like it. Thanks for sharing. You talk about using writing, too, on your exams. I had this conversation with my admin and said that since we only have two days between exams and grades, it makes it difficult; he agreed. Hey Sarah, you’ll definitely want to check out the free trial. 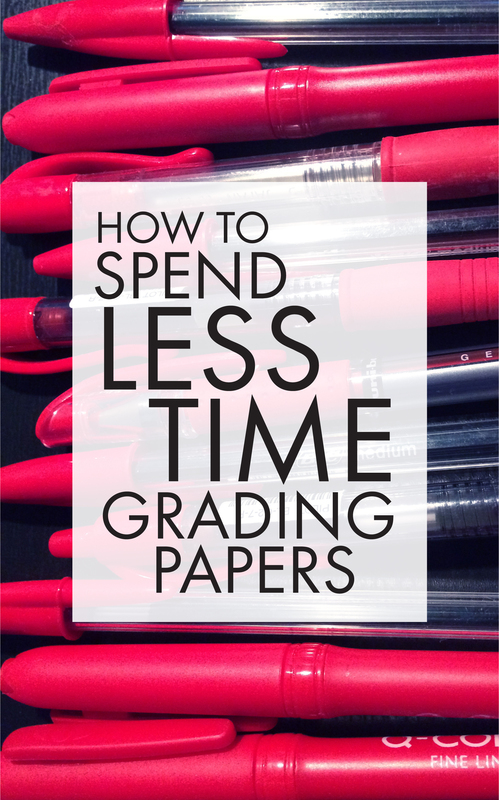 It might be just the thing to alleviate the headache of mis-scored papers. And, as for grading turn-around time, I usually have five days before fall semester grades are due, but spring semester final grades are due right away after exams. So, there’s no way to have an essay as part of my spring final exam, but, truth be told, everyone (including me!) is pretty fried at that point in June anyway. Thanks for commenting. I appreciate it! Trying zipgrade this week. I’m not very techno savvy so it should be interesting. My first try will be a 20 point quiz on reading. I’m hopeful that this will save loads of time! Thanks! Oh, how I wish my school was 1-to-1! As it is now, about 70 percent or so of my students are wired, but I have to be creative to find devices for those remaining 30 percent of kids. I tend to book the computer lab – a lot. It’s funny, but you’re the third person in about a week to mention Flubaroo to me, so I’m thinking that’s going to be my next tech adventure. I’m tempted to start playing with paper-grading within the http://www.turnitin.com website (my site pays for an expensive subscription to that site), but I can also see how the Google rubrics could play an important role in scoring. Awesome! I have used Turn It In briefly– it was somewhat frustrating because it flags even the smallest phrase as plagiarized. They may have made changes since I used it, but that was taxing. It flagged papers for common phrases/wording that the students had not taken from another writer. I love to use Google Forms for student feedback, general surveys, student information at the beginning of the semester, quizzes, tutoring logs, communication documentation, etc. I can randomize question and answer order which is awesome for quizzes. All of the data is collected in a Google Spreadsheet and I can sort it as needed. Flubaroo can then grade it based on a key you submit in the form. There are great YouTube tutorials for all of the Google apps that are very useful and answer even the most basic questions. The more advanced add-ons like Doctopus and Goobric is explained here: https://www.youtube.com/watch?v=r0NXeDKPyls. You don’t have to use Classroom to utilize Doctopus. Thanks, Jesshall. Okay, now you’re gettin’ me all excited about grading papers. Craziness, right? Yup! Used zipgrade today and WOW! I gave the students a short review, gave the test and graded it as they finished. I also gave them the opportunity to fix the erroneous answers, if they wanted. Some did, some didn’t. I was done grading before the class was even over. Of course, this wouldn’t work for all assignments but it was awesome for the reading quiz! I think I will bring it to a colleague’s attention when we establish our exams. Thanks for the useful tool! I love ZipGrade! I use it for our district-mandated unit pre- and post-tests along with most other multiple-choice assessments over 15 questions. Doing item analysis by hand is ridiculously time-consuming and having the technology to amass that data for you is priceless. For next year our district is adopting an online platform called Mastery Connect, which will have a ZipGrade-like feature. I think it’s a great idea, but I’m a little disappointed that it apparently requires a document camera; this means I’ll HAVE to grade those papers at work instead of bringing them home to grade on the couch with my iphone. 🙂 I’ve enjoyed being able to watch some TV while scanning and checking quizzes or tests! Thought you might be interested in checking out grade cam as well it links directly to power school. Great idea for all of those Power School users out there! Thanks. 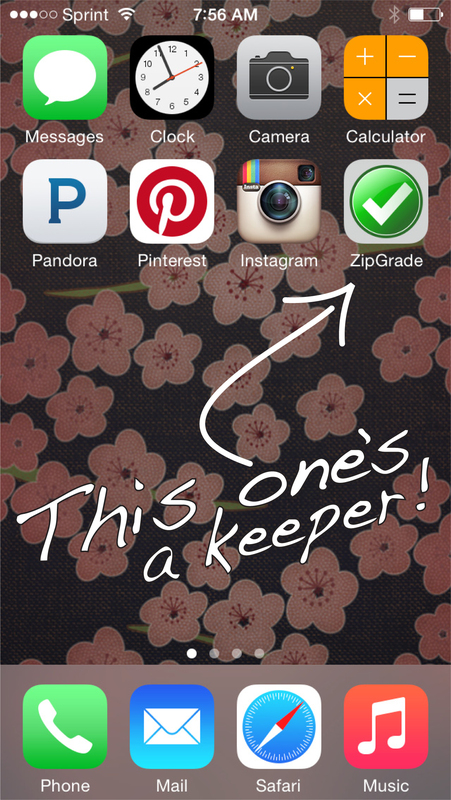 I have been leaning more towards this app, and you have me convinced to try it! I’m a science teacher and I hate wasting paper (but let’s be honest, every teacher, even environmentally conscience ones go through a lot of paper). Some one already mentioned Flubaroo–let me tell you–IT IS AWESOME! I am a Chromebook classroom and am Google Apps for Education Certified. This means that I have 30 chromebooks in my classroom at all times. In fact, that is why my students did as a bellringer/warmup EVERYDAY! I would create a Google Form, post it on our Google Classroom page (kind of like Edmodo, but Google’s version). It was always 5 questions, 3 from the day before’s information (or some vocab terms), 1 from last week and 1 question from the previous unit. The students would hit submit, and Flubaroo would grade it for me AND send the score report AUTOMATICALLY to the students. It also color-coded if a question was missed frequently. (I added up what the students made each day and put it into the gradebook as a weekly quiz grade, so 5 days, times 5 questions = 25 points). It is such an easy, quick assessment and it literally took me 10 minutes to type the form and post it, and it takes students less time to answer it. I do NOT use Flubaroo for major assessments, simply because it is hard to police honesty, and I have a few students who have wandering eyes. Can’t wait to try ZipGrade. Thanks for everything! I used ZipGrade this year for all my assessments and it is marvelous! I was at a workshop last week, and one of the other teachers mentioned that she had a class set of answer sheets laminated and gave the students dry-erase markers to bubble in their answers. She would scan the sheets, wipe them clean, and re-use them. She said the program had no issues reading them. Seems like a great way to save some paper. Thought I would share! Great idea, Natalie! Now, I’m thinking I could just put ’em in sheet protectors and skip the trip to the laminator altogether. Definitely going to try it this fall. Thanks for planting the seed of an idea! Great review, very insightful and well-written. Quick question about your custom sheets: how were you able to edit the answer sheets to fit your need? Did you run into any trouble making it work with the phone scanner? Thanks! I just started using it and absolutely love it! I too have broken up with the Scantron machine, lol! Since I am new with it, I am still trying to figure it all out but love the speed and especially the item analysis. Can you tell me how to print the Grade Test Report? When I click on this icon, it only shows the list of students. What am I doing wrong? I know, Sharon! My kids are now spoiled because I’m able to post their scores so quickly. Ha! Laura, this blog has changed my life! I was going to plop down $800 for my own Scantron machine and got the Zipgrader instead. Lord have mercy, it’s made grading multiple choice portions of my tests so easy and, frankly, it’s made it more likely that I’d put the students’ grades in the computer in a timely fashion. I used to dread the tedium of scoring, but the novelty of the students already knowing what they have on the objective portion makes it so much better. Thank you so much!